In 1987, they travelled to the UK for stints in Dublin, London and at the Edinburgh Festival, while Mangan was offered a 10-part television series by LWT, “re-dubbing old and forgotten TV serials”. On top of that, negotiations advanced regarding the filming of Mangan’s original screenplay, This One’ll Kill Ya. Within another three years, the team’s shows would gross over a million dollars. A friend had sent Mangan a copy of Ercole, Sansone, Maciste E Ursus Gli Invincibili (Giorgio Capitani, 1964) in the post. The film was a late link in the long chain of Italian sword-and-sandal or “peplum” films which had begun with Le Fatiche di Ercole (Pietro Francisci, 1958). The English-language title of Capitani’s film is Samson And His Mighty Challenge, though the original title translates as Hercules, Samson, Maciste and Ursus: The Invincibles, making it a kind of Peplum Avengers (or, if you ask Mangan, “the Dirty Dozen of the Greek set”). Alan Steel (AKA Sergio Ciani) was the twelth actor to take on the Hercules role in seven years, teaming up with the fantastically named Nadir Baltimore (Nadir Moretti) as Samson, Howard Ross (Renato Rossini) as Maciste and Yann L’Arvor as Ursus. To give the original film its fair due, while it doesn’t represent the pinnacle of its genre, it was light in tone to begin with, just not quite as bright as it would become. The two films share a relationship not dissimilar to that between Zero Hour! (Hall Bartlett, 1957) and Airplane! 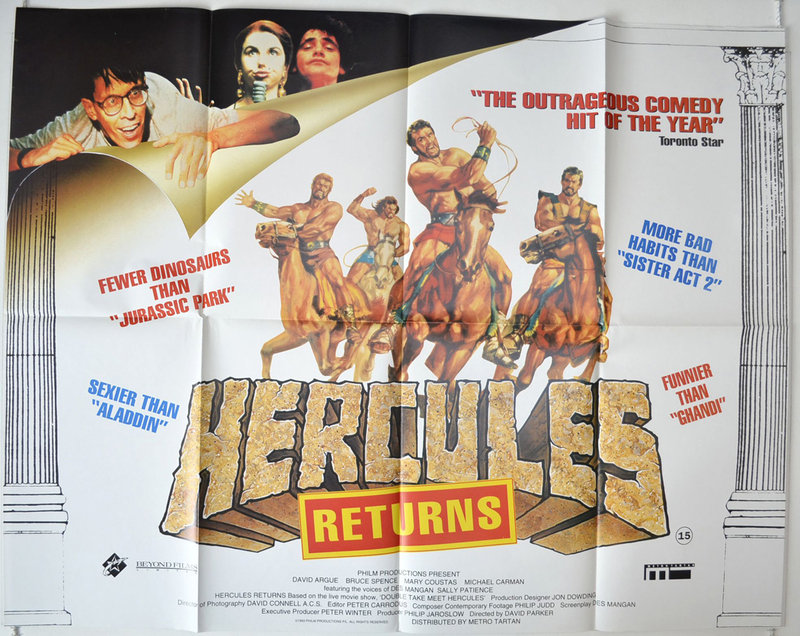 (Jim Abrahams, David Zucker, Jerry Zucker, 1980); only Mangan and his team could have extracted what would become Hercules Returns from Samson And His Mighty Challenge. As Brad McBain, the listless cinephile who decides to strike out on his own, they cast David Argue (star of Gallipoli, BMX Bandits and Razorback) alongside Mad Max icon Bruce Spence, TV comedian Mary Coustas and Michael Carman as the villainous Sir Michael Kent, of the Kent Corporation. From his own pocket, Jaroslow provided a budget of “well under” a million dollars Australian, which stretched to a crew of 140, 200 extras and a shooting schedule of just eight days, mostly in and around Melbourne’s Palais Theatre. 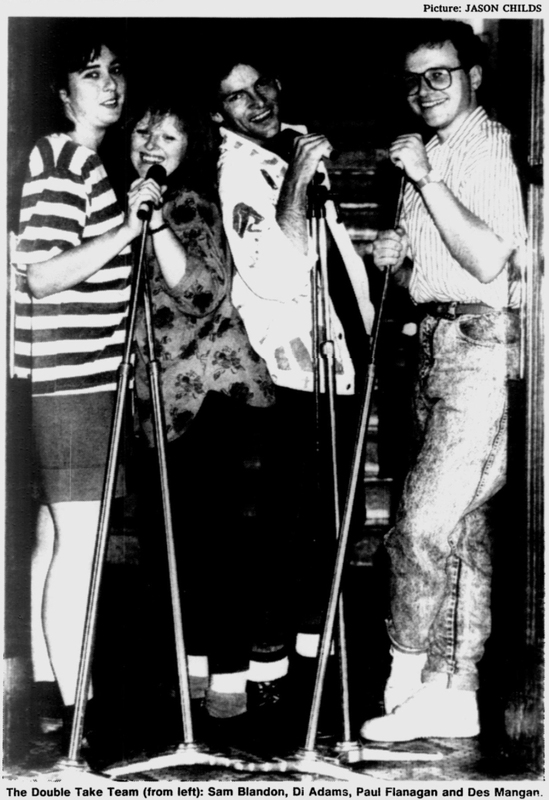 Just as they did in live performances, Mangan and Patience stayed out of the spotlight throughout, with Argue, Spence and Coustas miming to their performance where the two sections of the film overlapped. Australian film critics and TV personalities Ivan Hutchinson and Margaret Pomeranz were given cameos, reviewing the film while exiting the theatre: “I loved it. I’d give it a five.” (in 2003, Pomeranz would lose her position presenting films on Tuesday nights on SBS at the same time Mangan lost his own Monday slot). Critic David Stratton (Pomeranz’ co-presenter on The Movie Show) claimed he’d also been invited to cameo, but couldn’t due to a scheduling conflict. All of which at least suggests a clever scheme to get the critics on-side. If so, while it was a good effort, it was ultimately doomed. “Everyone laughs at fart gags,” Sally Patience told the Independent in late 1993. “Critics may just go, ‘Oh, it’s toilet humour’, but you know that they’ve secretly been enjoying it.” Ultimately, the film made $318,788 at the Australian box office, something around $555,000 in today’s money (approx £255,000), making it a financial failure and definitively scuppering any plans for sequels. Phil Jaroslow retired from the movie-making business and is currently CEO of Australia’s largest manufacturer of frozen cookie dough. Mangan and Patience continued performing as Double Take during and after the film’s release, bringing Double Take Meet The Killer Bees to the UK for a run at the Prince Charles Cinema, London in 1993. The Independent described the show, based on Alfredo Zacarías’ The Bees (1978) as “90 minutes of non-stop sabotage”. 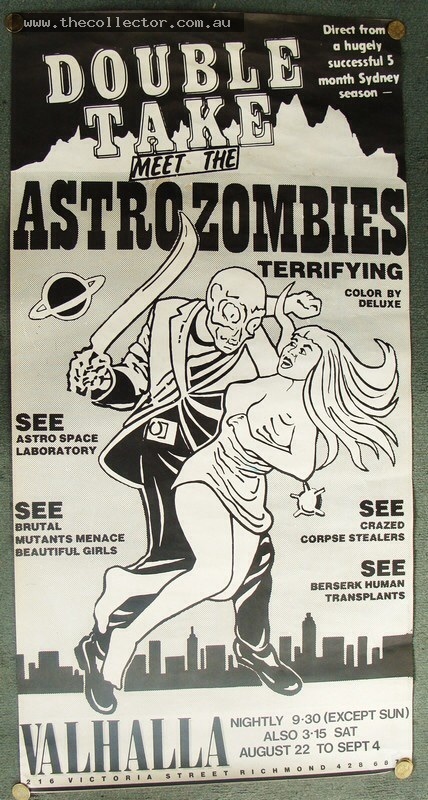 The Killer Bees was followed first by Double Take Meet The Pirates, riffing on Morgan, The Pirate (André de Toth, Primo Zeglio, 1960), and then Double Take In Outer Space, based on Star Crash (Luigi Cozzi, 1978), before Double Take disappeared into a 10-year hiatus. In 2006, Mangan returned briefly with a new live show, Double Take’s Horror Hospital (based on Antony Balch’s 1973 film of the same name), and a new creative partner, Gabrielle Judd. David Parker resumed a successful career as a cinematographer, often in collaboration with his wife, the director Nadia Tass, though he returned to the director’s chair once for the spectacularly mis-timed paparazzi-themed rom-com Diana & Me (1997) and then again for 2016’s The Menkoff Method. 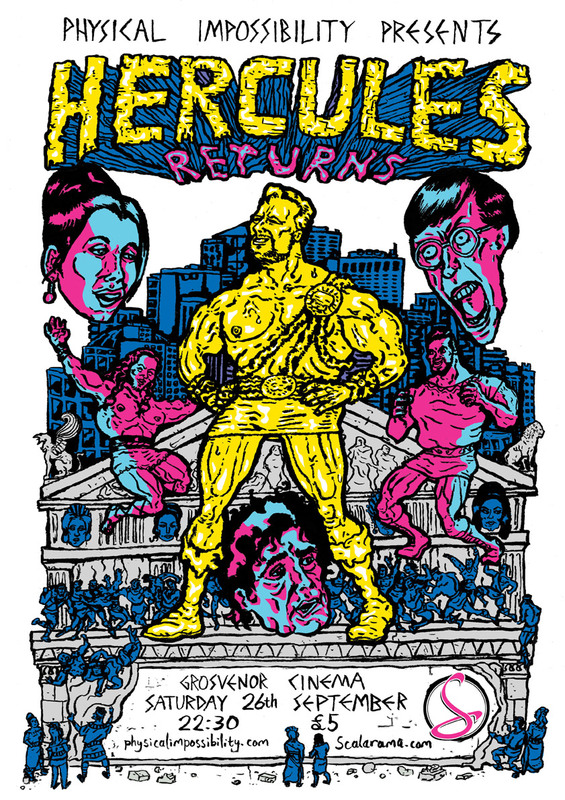 Filmmaker Mark Hartley, who got one of his first credits on Hercules Returns, as “music video director”, went on to produce a trio of hugely popular documentaries on cult cinema – Not Quite Hollywood (2008), Machete Maidens Unleashed (2010) and Electric Boogaloo: The Wild, Untold Story of Cannon Films (2014). When he passed on directing Hercules Returns, Mangan referred to his mooted directorial debut. “I want to do something like Unbelievable Truth or something, where there’s four people in it. That’ll be my first one. Unbelievable Truth II. With Hercules in it, of course.” It never materialised, nor did This One’ll Kill Ya. Mangan is still best known, in Australia at least, for presenting cult movies on the SBS channel (UK readers may think of Alex Cox or Mark Cousins presenting Moviedrome). He wrote a book, This Is Sweden Calling (foreword by Gina G), based on his experience presenting Eurovision as Australia’s answer to the UK’s Terry Wogan. Recently, he’s reprised his real-life role as cult movie presenter for the Garth Marenghi-esque Top Knot Detective. 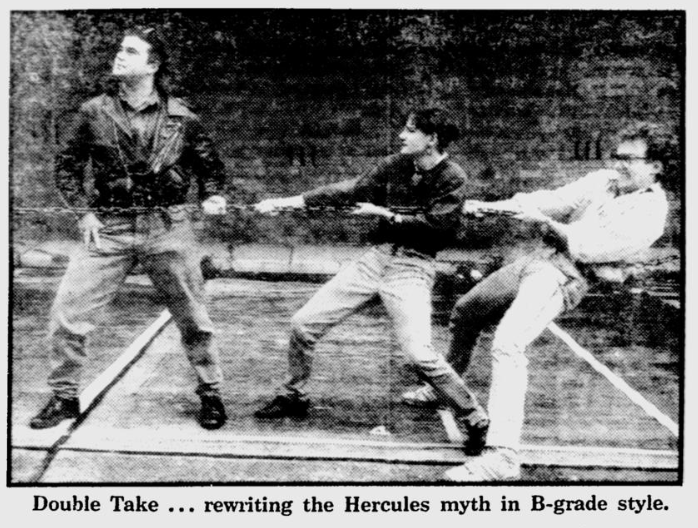 Despite the muted critical response and modest financial return, Hercules Returns has that often-coveted, rarely genuine cult status. 26 years later, despite being, officially at least, long-unavailable, fans across the world have an enormous amount of affection for it. 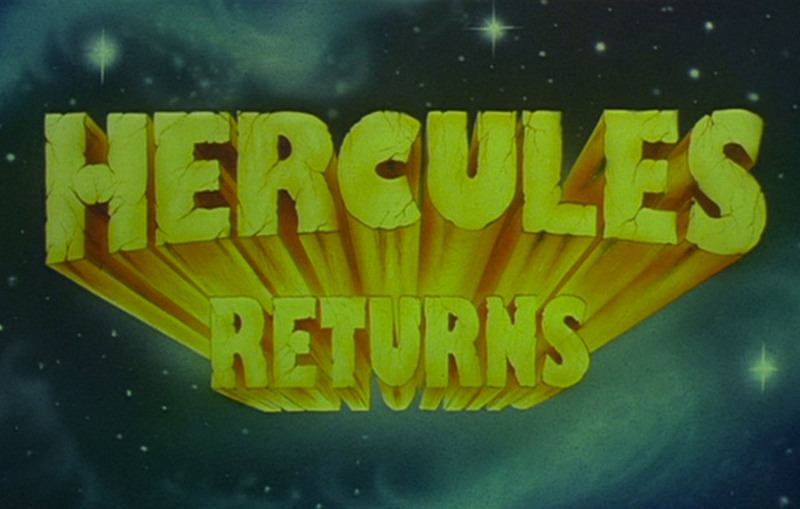 Whether on IMDb, YouTube, Amazon, Rotten Tomatoes, random forums or countless blogs, wherever Hercules Returns pops up, you’ll find dozens of comments along the lines of “funniest film EVER!” or “my favourite comedy of all time,” It currently holds a 95% audience score rating on Rotten Tomatoes – “no critic reviews yet” and still no other film quite like it.